As an advertiser, you ought to be updated with any new addition or update in all social media platforms especially if you are strongly relying on those social media platforms in running out your ad campaigns that market your brand, product, or service. It should be mentioned that day by day, every social media platform is trying to boost and update their ads services to enhance the advertisers’ experience on their platform, so all marketers, advertisers, brands, retailers, and businesses should be aware of every daily update in any social media platform. First off, we start with the most highlighted update on the Facebook platform to its ads services, as Facebook is considered to be the most popular social media platform that attracts advertisers from all over the world. This month, Facebook announced on its official business blog that they are introducing a great suite of new solutions that enable all Facebook advertisers to better manage their ad campaigns across the Facebook platform, especially control their ad placements. This new addition is considered to be one of Facebook’s new Brand Safety capabilities of the Facebook Marketing Partners (FMP) program. This new capability recognizes companies offering proprietary solutions that can help Facebook advertisers review content options and control where their ads will appear. This means that all Facebook advertisers will able to deal with third parties to manage their brand safety controls for Facebook campaigns. On this front, it should be pointed out that this addition is not Facebook’s only effort, but the Facebook brand safety suite includes some effective solutions for all advertisers; these solutions provide them with more choices and better control over where their ads appear, such as publisher lists and publisher delivery reports that advertisers can use to create block lists, removing specific publishers and apps from ad delivery in Facebook in-stream, Instant Articles and Audience Network. No one can deny that LinkedIn is considered to be the destination for all professionals in to gather, make deals, and network across this intelligent platform. So what’s up on LinkedIn this month? Don’t worry, you will be informed. This week, LinkedIn mentions on its official marketing solutions blog that they are bringing a new solution that can effectively help all marketers, advertisers, businesses, and brands grow their business in an easy and simple way without wasting time and money. LinkedIn unveiled its interest targeting in Campaign Manager, a new option that enables all advertisers to engage with a specific audience with relevant ads that match their professional interests depending on their shared content on the LinkedIn platform. This means that all marketers or advertisers can reach their ad campaign goals and grow their business by relying on these additional solutions. In addition, the LinkedIn new ad solution “Interest Targeting” will also allow advertisers to harness more than 200 professional interest categories, like artificial intelligence, global economy, customer experience, and more in creating a professional campaign that can reach the targeted audience and achieve effective results. Serve relevant ads and content that match a member’s professional interests. Deepen their influence with the buyer committee within their target accounts. Reach those interested in pursuing a certificate program. 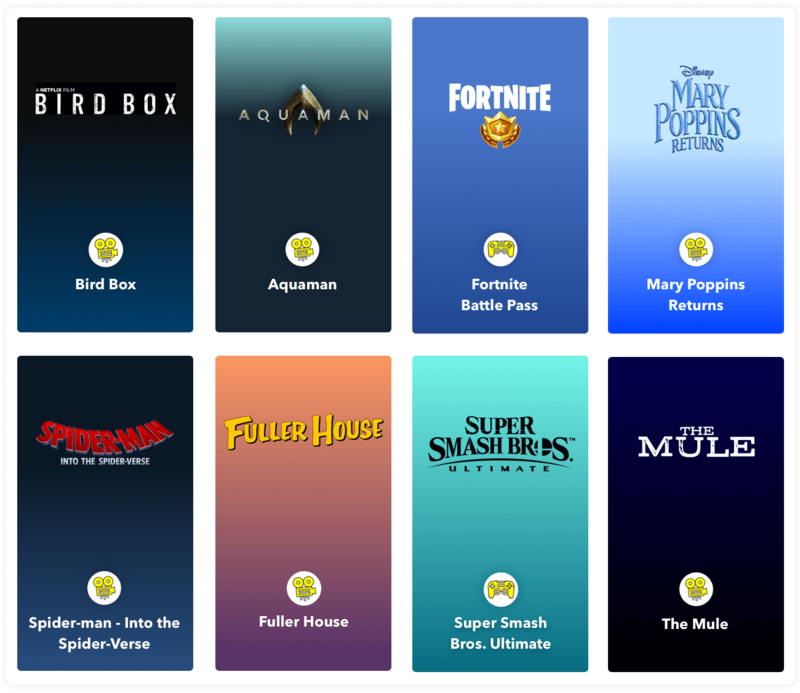 Every month, Snapchat is publishing a new analytical report, which showcases a great set of insights, habits, and trends in Snapchat each month, as a part of Snapchat’s insights series that cover what Snapchatters are interested in, where they prefer to go, eat, find entertainment, and shop, and which topics they talk about the most. This report is considered to be an effective guide to all advertisers, businesses, marketers, and all brands, which allows them to specifically lead impressive campaigns that catch the audience’s attention. 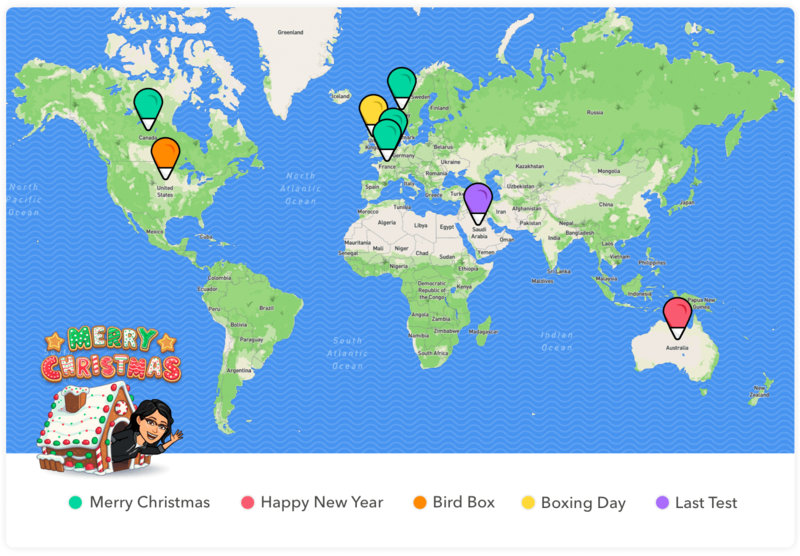 Earlier this month, Snapchat published on its official business blog the report of December 2018 that covers the trending topics and slang among all Snapchatters globally, especially amongst the US Snapchatters, including Merry Christmas, Bird Box, Boxing Day, New Year, and last test. We will showcase a suite of great visuals that will help all advertisers, marketers, ad campaigns creators, brands, businesses, and all people who are interested in social media advertising in this report. 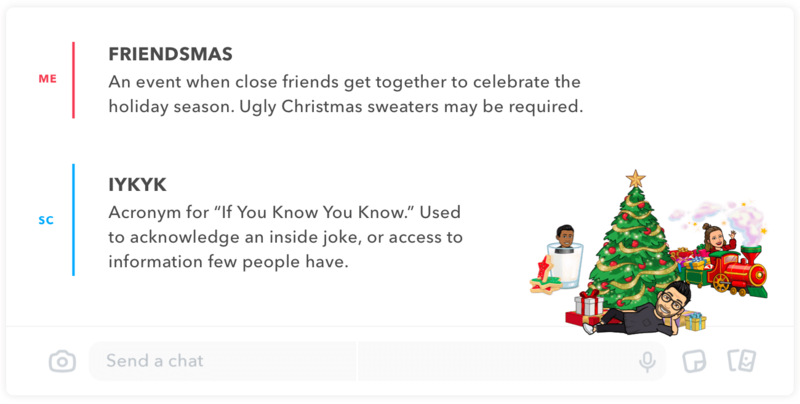 The below graph will showcase the top trending topics that Snapchatters in the US talk the most about it, such as the holiday season with Christmas, the New Year, end-of-year festivities, and Bird Box. Coming to the trending celebrities amongst the US Snapchatters, it was noted that the Snapchat Trending Celebrities list was surprising for many of us, as it included Cardi B, Offset’s relationship, and Los Angeles rapper Blueface. 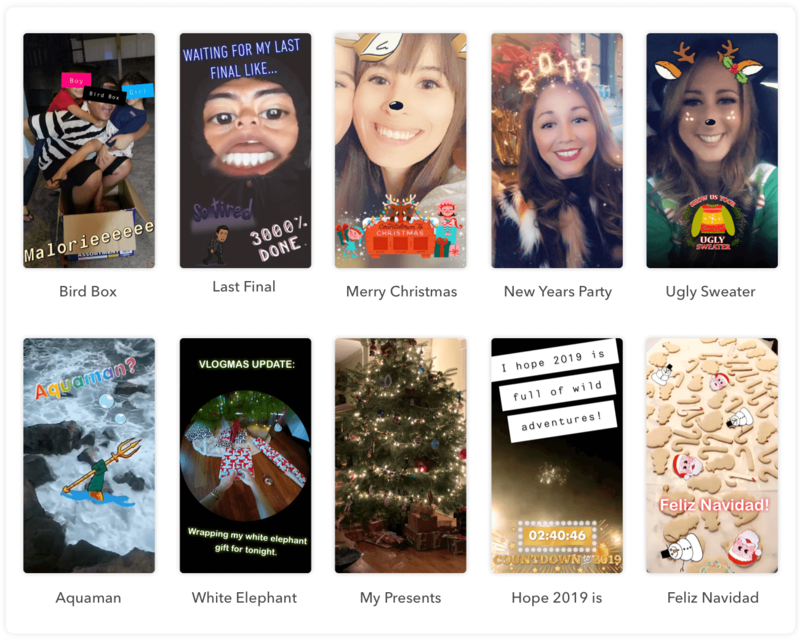 It should be mentioned that every month, Snapchat includes a new country’s analytics in its monthly trending topics report alongside the US; this month, Snapchat includes France’s analytics that showcases the trending topics amongst the Snapchatters in France. 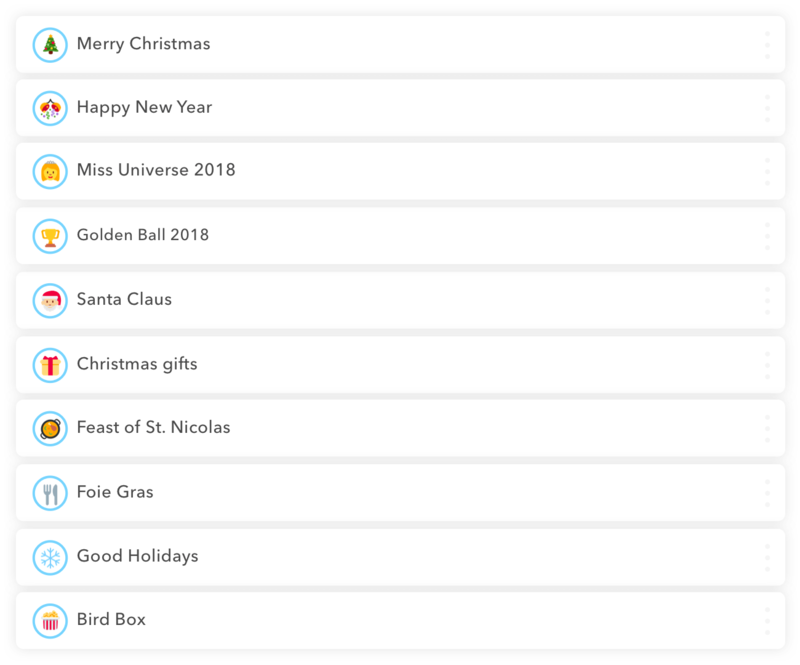 Trending topics in France were the holiday season with Christmas and New Year – on top of the trending topics’ list -, Netflix’s Bird Box, and Golden ball.